We will always stand behind our artwork and its authenticity, and take seriously the act of passing on the pride of ownership to our clientele. Our commitment is to you, and the integrity of your collection. All of the hand signed Dali lithographs in this collection were examined, documented, verified as authentic, and signed on reverse by Albert Field of the Salvador Dali Archives. Three decades ago, surrealist Master Salvador Dali pre-signed several hundred sheets of paper for the express purpose of producing hand-signed limited edition lithographs. Our principal secured all known remaining paper from Dali publisher Levine & Levine, and selected twelve stunning Dali images in order to create "The Final Editions of Salvador Dali." These magnificent images have never before been published as hand-signed lithographs. Once these editions are sold out, they will never be available in this form again. This magnificent collection of lithographs has been masterfully executed by one of Dali's original chromistes, Jean-Pierre Remond of Paris. The press that Mr. Remond used is one of only a few remaining old-style lithographic presses still in use in the United States. Master Dali himself printed many of his lithographic editions on this press. Our collection of authentic Dali prints are printed on Arches, Japon and Rives paper. All of the 22" x 30" images are available on both Arches and Japon paper. Arches paper is a high quality air-dried 100% cotton paper of warm white color. Rives, also cotton is more heavyweight. Japon is creamier in color, has silk-like fibers and has the lightness of a woodpulp paper. No two sheets of Japon paper look exactly the same. Collectors often prefer Japon paper although there is no actual superiority or durability when compared to the other two. This is a collection of twelve images, which are renderings of original Dali works of art from varying periods of his illustrious career. The original painting of the image Invisible Face (Ruin of the Head of Medusa on Landscape) was created for Edna Woolman Chase in 1941. Spectral Horse (Molecular Equestrian Figure) was created after a watercolor which dates from 1952. Disintegrating Mother and Child (Dynamiques Raphaelesque) is from an original drawing on paper also from that year. The Don Quixote Trilogy, The Warrior's Heard, The Story of Don Quixote and The Gift of Mandrino are thought to be autobiographical as they resemble an aging Dali. Each of these lithographs was signed, in pencil, by Salvador Dali. 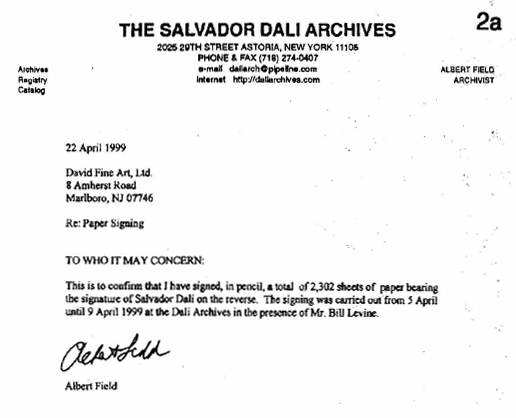 All signatures were verified by official Dali archivist, Albert Field, in 1999 prior to his death in 2003. Mr. Field took the extraordinary measure of counter-signing on the reverse of each archival sheet. Each fine art lithograph is shipped with an original certificate of authenticity from the publisher.